Until Cuiabá the flight options are by: Azul, Trip, Avianca, Passaredo, TAM, GOL, Web Jet. From Cuiabá to Alta Floresta, The Trip Airlines (0300-789-8747) has daily flights leaving at 11:55am and arriving at 2pm, and in the way back leaving Alta Floresta at 2:20pm, and arriving in Cuiabá at 4:25pm. The hotel provides Airport-hotel transportation. 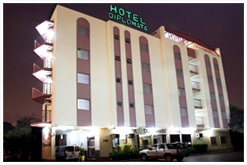 If the fisher needs (or think it is better, because the short time Between some connections) to spent a night in Cuiabá to take the flight to Alta Florets in the next day, the host suggestion is the Diplomata Hotel.